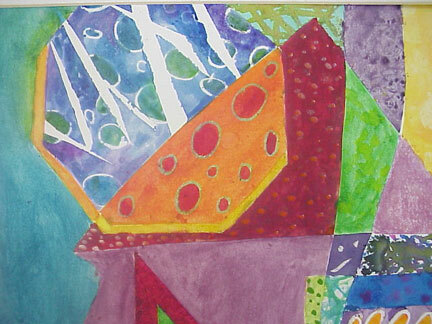 This page was started as a result of a Getty Teacher ArtExchange post searching for watercolor ideas. 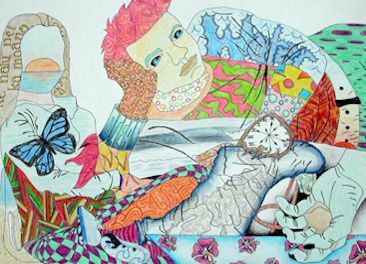 The challenge is now out to all art teachers to submit your middle school and high school lesson ideas. Users of this site are invited to vote for their favorite WOW lesson. Send your idea along with one digital image by clicking the Submit a Lesson link. Paintings went on the Drying Rack . Next, paper was cut down to 4 ¼" x 6 inch (10,8 x 15.25 cm) cards (the size of postcards). Then on the back a line was drawn and a square to indicate a place for the stamp. Then the "bamboo painters" came in and painted bamboo or some flowers. We have a little round Oriental stamp to add the finishing touch. Barbara go this idea from Arts & Activities Magazine article written by Paula Guhin. 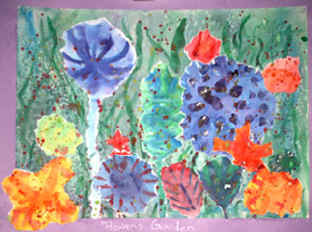 Students outline floral compositions with glue - allow to dry then paint with wet-n-wet watercolor. Any subject can be used. Barbara chose to use flowers from life as well. Students draw directly with the glue - making flowing contour lines (no pencil lines). When the glue is dry - fill in with wet in wet watercolor. Optional - accent with fine point black markers. Outline both sides of glue and interior shapes made by watercolors. permission and will be removed at artist's request. Watercolors a la Dürer: (See lesson plan to on IAD). Students studied the print Rhinoceros by Albrecht Dürer (engraving that Dürer did from a description of a rhinoceros). Student drew an animal of their choice on Watercolor Paper - leaving a border to be stamp printed. 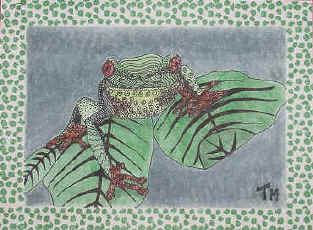 Fanciful patterns were added to the animal and an eraser stamp was cut to compliment the patterns. Student stamped the border by coloring the stamp with watercolor markers. Shown is 8th grade sample. Endangered Species Montage Students research an endangered animal of their choice. After finding several views, they created a composition combining at least three views - including one focus down image for interest. Compositions were rendered in Crow Quill Pens and India ink and watercolor. This is a high school example - adaptable to middle school. Complete lesson plan on Woody's site. 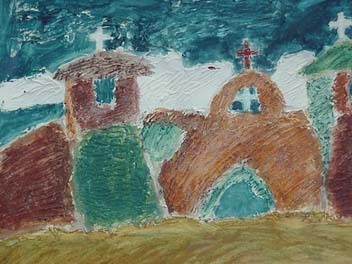 Students drew Adobe churches on quality water color paper. 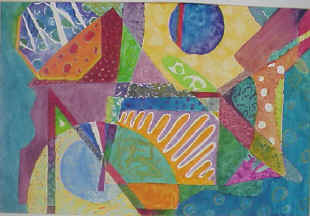 torn paper collage elements were added. Modeling Paste textures gave interest. After the collage was complete, student painted with watercolors. The modeling paste gave some nice results. This lesson was done with 8th grades and is adaptable to high school. Submitted by Samantha Shelly "Leaving the White"
Masking areas of watercolor with tape to do a wash for the sky. 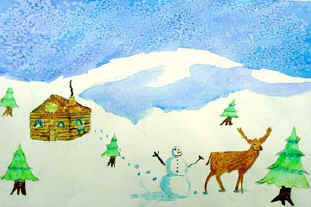 Added texture and interest is achieved with salt to give a snowy effect. The salt also adds a little glimmer. Dry Brush techniques are discussed for texture on the trees. From Judy: Make connections to Grandma Moses and Currier and Yves. This flower garden that has an impressionistic quality. Students first do a watercolor wash on a background sheet, using mostly cool (lots of greens) colors and adding salt and paint splatters for texture. Next they do a couple pages of flowers, using mostly wet on wet techniques -- varying shapes, sizes, colors, etc. Next they tear out the flowers, arrange them on the background and glue. The last step is to add stems and grass and a few more paint spatters. First I ordered 200 lb. Watercolor Paper from Cheap Joes. I cut it down some on my Rotatrim . Volunteer students came after school and we wet the large sheets with water and squirted liquid watercolors on them and sometimes added salt for crystallizing. From Marian Coleman: We do 3 technique sheets (washes, special techniques and how to create whites) and then an 11 x 14 (28 x 35.5 cm) landscape watercolor. Students do a basic composition using photos on 11 x 14 (28 x 35.5 cm) white drawing paper. Then they transfer to good paper using the window. They must use their techniques in the landscape. Watercolor collage is great too. 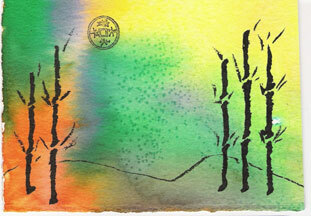 Create different colors/textures on watercolor paper, cut or tear and create the subject. 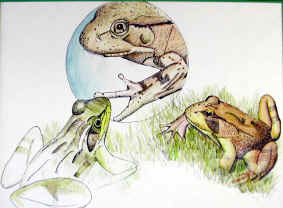 We've done natural subjects such as animals, fish, birds, flowers etc. Keep the subject simple for best results. Out of focus water colors. You have to have access to a slide projector... and some images. I had slides I had taken of various subjects, a window with vegetation around it, a simple landscape, some of my irises in my garden. I imagine if you had any image it would do. Students had to do three pieces of postcard sized water color paper brushes, water, watercolors, paper towel. Dim lights. Tell them to work fast. 1. Day one show image out of focus. Give them 8-10 per image. Do at least two images. first Instructions. Use wet on wet to capture the sense of the image. No black in trays! 2. Day two tighten focus a bit. Do the same ten minute per image. More than one image. Begin to loosely define the image. 3. Day three tight focus. They see image. Refine the details. Don't start over, just resolve what you have - ten minutes each - do all images. Water color postcards: Create a list of water color techniques - sponging, salt, wet on wet, gradations, dry brush, saran wrap scrunched on wet wash, tissue lift off. Do sampler. 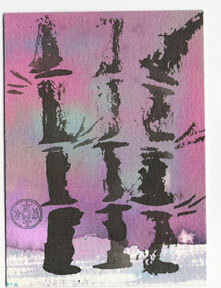 Final image, cut up your samplers and create a small collage landscape using the bits of the now dry samplers. I had two examples pre-made. Draw a face: Can be a self portrait. Using Tracing Paper repeat 3 times in a grid format - so you have a Warhol like image of four. Ink over with permanent ink. Apply water color washes. Go for four different moods. Wet on wet images: Tape paper down. Dampen. Using soft puddles color do a wet on wet. Let dry. Look at them. Work into them using pen and ink. Any subject matter... Landscape doodle... still life, flowers. This year my 7th graders did crayon rubbings on 18 x 24 (46 x 61 cm) paper - both sides - water color, salt, scrapings, more rubbings, stampings... tore the paper into 'pages' (9" x 6" / 23 x 15 cm) ) - piano hinged for the binding and added small origami books, scraps of sketches, lots of stuff to the pages - then searched for descriptive passages in text - retyped, cut apart and collaged in the books. We got in a lot of techniques, color theory, textures... and they were beautiful... so if everyone is tired - this may be a nice way to get some watercolor in. From Wendy Free: The theme from my final project is machines - from simple (see-saw, wheelbarrow...) to complex (submarine or computer). Students will decide upon a subject by choosing a machine that is really important to them (shower) that they appreciate or use everyday OR one that is visually appealing to them (race car) OR one that they think is super-cool. They will procure photos from Google images or bring them from home. 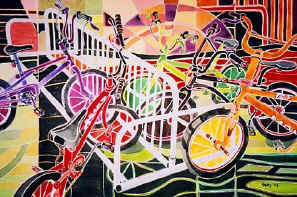 There are several choices for methods of representation which I have examples of (I got them from art.com by doing a search for bicycle. There are LOTS of different methods of representation shown) - from showing the machine in a scene, drawing a close-up of one or more parts, abstracting, distorting, embellishing design features... Students will be asked to incorporate design features into their composition which communicate characteristics of their machine. they will do a sketch and final enlarged copy in pencil. Color swatches come next with watercolors. Students will create a mixed color scheme that includes a full range of values. They will use those colors to paint their final composition and incorporate at least one watercolor technique we have learned this year (wax resist, blotting, etc.). Finally, we will use Ultra fine point Sharpies and colored pencil as needed for fine detail and emphasizing outlines. The kids say they think its a cool last project! From Vicki Ranck: Another idea is to take pictures of local landmarks for the students to work from. It makes the learning real. Not to mention if you got twelve good ones you could maybe get a calendar printed up. From Judy Decker: Not an easy project for end of the year... "What's the Bigger Picture?" This will require students to do research on local history. Select a landmark - or an area of the city - and research what was there before - Find out some history of the community. This idea has a picture within a picture. The smaller picture will be a focal point - rendered more carefully and maybe accented with Crow Quill Pens and India ink drawing techniques to refine. For my "Invisible Art" project, I will select a historical picture of Gregg's Department Store - the last downtown Lima department store to close its doors (1985 - after over 100 years of serving the community). I think I will use the bold colors of John Nieto for this. I may even weave it with a painting of the building the stands in its place (the Allen County Court of Appeals - that also houses the Allen County Education offices - little looks the same as the old store building inside or out). The larger second painting will be of rural fields - the old landscape pre-1960s of Elida Road with drawings of the Lima Mall woven in (built in the mid 1960s). The larger painting will have the story written about how the Lima Mall brought about the downfall of downtown Lima - which now hosts just a few office buildings, court house, a couple restaurants and empty buildings. The larger painting may use colors and distorted perspective of Wayne Theibaud (see his landscapes). The larger painting will not have as much detail - so the words will show up. Another artist for reference for this unit would be Pat Stier. Pat Stier - interesting landscapes that could be done with watercolor collage. The smaller painting could be raised up 3-D from the bigger painting if desired - with the larger painting forming a frame. This will be a lesson about changes in the community and a reflection on the past. This idea actually brings together five separate ideas that were shared. The mat to frame it might even be old Gregg's ads collaged. The Lima News (Archives) would be a good source for those. I could take my digital camera in and photograph them - print them out on a color that would accent the painting - or maybe "parchment" paper. If anyone uses this idea - I would like to have a sample to show with the description - then YOU can be in the contest. I have no need to do my "invisible art" - I worked at Gregg's for 6 years in advertising. The closing of the store brought me back to education. My definition of WOW for this one is Words on Watercolor. This lesson uses many experimental techniques. Georgia O'Keeffe Watercolor Flowers See Ken Schwab's student work and Sue Galos'.